So, eggs. Despite being an integral part of most baked goods and breakfasts (and even some lucky lunches and dinners) worldwide, it’s not easy to be an egg. Not a day goes by without an egg getting cracked, whipped, scrambled, beaten, or fried, and sometimes even (!) separated. The poor little dears – it’s just not right, all that egg-related violence, and I think something should be done about it. That’s why I like to bake my eggs. Gently. I like to tuck them gingerly into little ramekins, nestled sweetly against a soft bed of Sriracha-glazed scallions, and tenderly bake them until they’re pleasantly set and ready to be served with buttered toast. The whole process takes minutes, and is really a very humane way of preparing a simple and delicious brunch. If you bake your eggs on a pile of Sriracha-glazed scallions, which I highly recommend that you do (not only to support the institution of brunch but also to spread the message of intolerance for crimes against egg-manity), you’ll probably want to eat more than just one. Which I can assure you is perfectly alright. 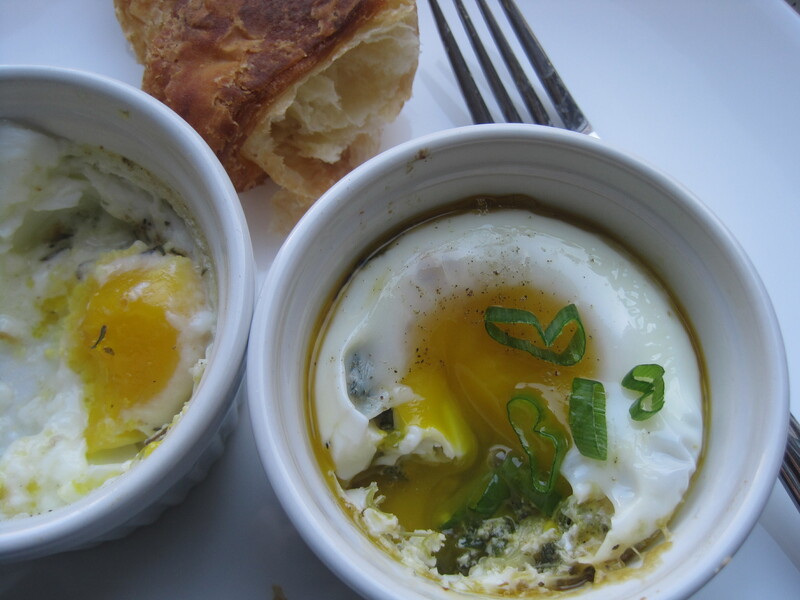 When faced with piping hot ramekins filled with sweet and spicy scallions and lovely, runny yolks, I think at least two or three eggs will be more than un oeuf. Preheat oven to 350ºF. Heat olive oil in a medium sauté pan over medium high heat. Throw in the chopped scallions and sauté, stirring occasionally, until the scallions start to become soft. Stir in the Sriracha, and cook for about a minute. Deglaze the pan with the rice wine vinegar, stirring the scallions for a minute, until they look shiny and glazed. Turn the heat down and season the scallions with salt and pepper. Off the heat, stir in the sesame seeds. Spoon the scallions into the bottom of two small ramekins (or one larger ramekin, big enough to hold 2 eggs) placed on a sheet pan or cookie sheet. 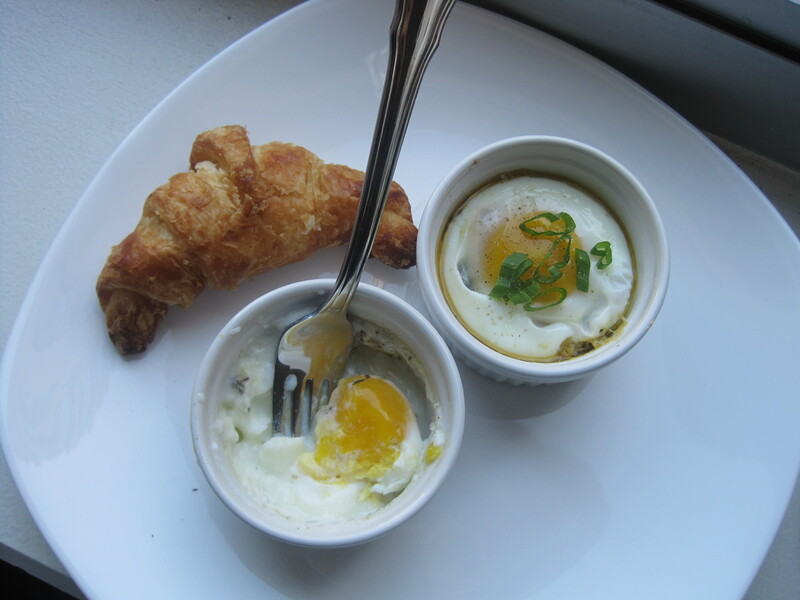 Crack the eggs into a bowl, and gently pour one egg into each ramekin, on top of the scallions. Be careful not to break the yolks. Lightly season the top of the eggs with salt and pepper, and place the ramekins into the oven. Bake the eggs for 10-15 minutes, or until the whites have set and the yolk is still a bit runny. Serve immediately, with an extra sprinkling of scallions and a slice of buttered toast (or maybe even a flaky croissant). adorable. great to have this recipe! but un oeuf of that, this is a post that chuckles the yolk in all of us…..
Oh, Miss Molly! How I do love your blog. Of course, this reminds me of "egg day" and the cream-filled ramekins. Yum. I hope you're thoroughly enjoying your 2nd round at FCI (it looks as though you definitely are.) I'd love to grab a coffee sometime and catch up with all your endeavors. Baking party??? I need to try out my gluten-free croissant recipe ASAP!